Ever dreamt of the perfect European break away with no hassle, luxury service and everything taken care of? Sail in luxury with Azamara Pursuit along the coasts of the Mediterranean and Eastern Europe. Pre & post accommodation included in both Venice and Athens. Why not ask your consultant to extend your stay to see more of Europe. One way flight from your closest capital city to Venice. 2 night stay in Venice at a 4 star hotel. 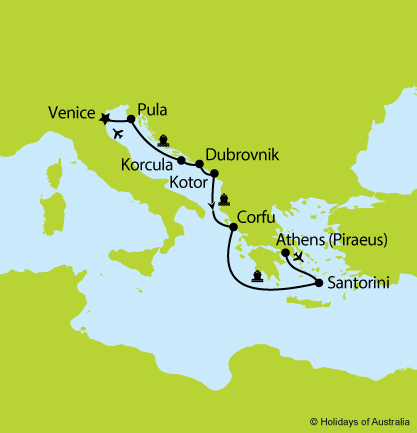 9 nights aboard Azamara Pursuit cruising from Venice to Athens with port calls in Pula, Korcula, Dubrovnik, Kotor, Corfu & Santorini. Includes on board meals and entertainment. Transfer from the cruise terminal to your accommodation. 2 night stay in Athens at a 4 star hotel. One way flight from Athens to your closest capital city. This tour has minimum numbers to depart escorted. ^Save $1000 per booking based on twin share, single travellers discount is $500. New bookings only. Sale is valid until 31 Mar 2019. Not combinable with other offers unless otherwise stated.